So, buying foundation has never been my forte, primarily because I always feel like a fish out of water. I've tried asking for suggestions from various makeup counters but lets be real, a name tag doesn't make you a Makeup Artist or a "professional" and with all honesty the people behind the counter are more interested in selling the product verses catering to your specific needs. Laments terms, they'll have you walking around looking like a powdered doughnut!!! As an inexperienced makeup consumer the most important thing I've learned is to ALWAYS take a relative or friend with you, or at least someone whose opinion you value. OK, enough of that. For this weeks look I used Urban Decay's Surreal Skin Mineral Makeup for my foundation. 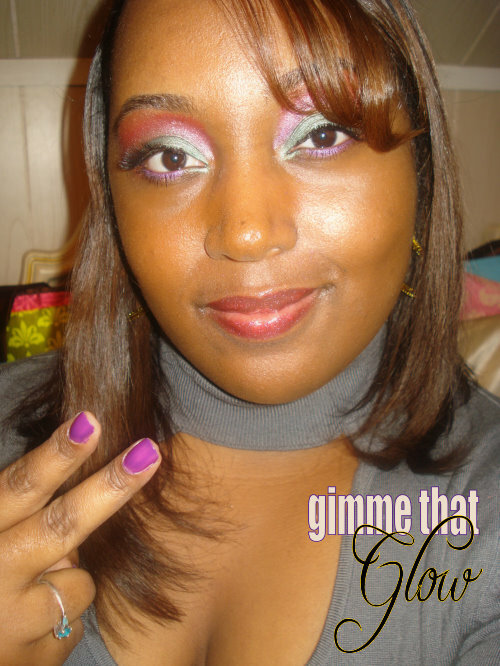 A big THANKS to Martini for hooking a sista up :-D I love this makeup, its the best foundation I've tried thus far. The only thing I despised about it was the crappy powder puff thingy that was attached to it. What the hell was i supposed to do with that? LOL I have ZERO patience for things that take a minute to figure out so I just tossed it in the trash & used a brush :-D As for the eyeshadow, although I'm an artist my nature, somehow "blending" is one technique I have yet to conquer! But, I'm getting more comfortable with applying my lashes! The i ENVY lashes by Kiss are super fab!!! Thoughts? Suggestions? Critiques? Drop me a line, I want to hear it!!! I feel ya on the foundation! I'm the same way. Love that lip gloss from NYX, you get a lot of color for a little price! BTW, I wanted to thank you for the Honeycat giveaway! Tried the bubble bath and I LOVED IT! 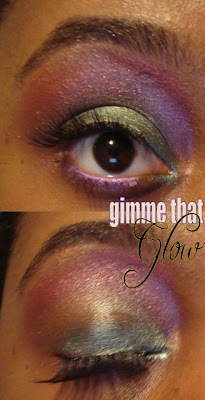 I actually shouted Gimme That Glow out on my recent video blog! I hope I said your name right! Hey Nik!!! Yes! I love how affordable NYX is and they have some of the best stuff! You are more than welcome, I'm glad you're enjoying the products. Definitely gonna check your post out! 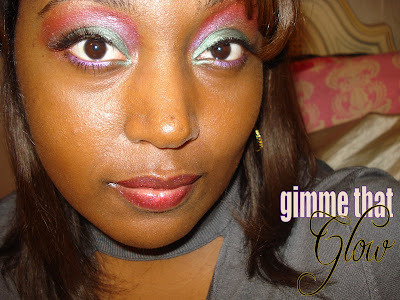 I like what you did with your eye makeup, but it seems like a little too much for the day.